Primary Perspectives team mate Zoe produced an excellent 'Women in Sport' special for her first show in her role as one of SBN's junior producers - featuring renowned guest #Olympian and #FIBA Hall of Fame honouree, Michele Timms, one of Australia's greatest #basketball players of all time, who joined the team in the studio for a chat! 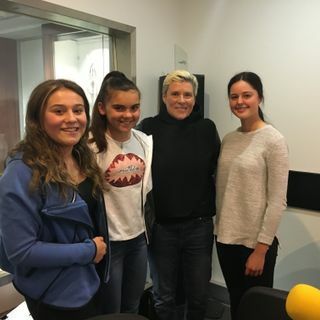 Plus Zoe and Kaylee welcome guest host, rising young soccer star Paige Zois - check out this excellent podcast! Michele Timms brief bio: ... See More Michele is one of Australia’s best known and loved female elite #athletes. Playing for the Opals in 264 matches; including three Olympic Games, she is one of the game’s all-time greats. Michelle appeared in four world championships between 1986 and 1998 and captained the #Opals to its first ever Olympic silver medal in 2000 #Olympic Games in Sydney. She was the first Australian basketballer to play professionally in Europe and played in the inaugural WNBA season with the Phoenix Mercury. Her number 7 WNBA singlet was retired in 2001 as a mark of respect. First Australian female basketballer to play in Europe (Germany). Played 264 matches for Australia. Played 285 WNBL matches and won five Championships – 1986, 1987, 1988, 1989, 1992. Represented Australia in four World Championships – 1986, 1990, 1994, 1998. Represented Australia in three Olympics Games – 1988, 1996, 2000. Basketball Australia Merit Award – 1991. Two-time Basketball Australia International Player of the Year – 1994, 1996. Played in the inaugural season of the WNBA for Phoenix Mercury – 1996. Captained the Opals to their first Olympic silver medal in 2000. Inducted into the Basketball Australia Hall of Fame in 2006.